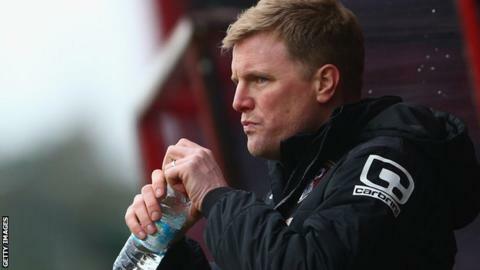 Bournemouth manager Eddie Howe feels his side must regain momentum following an at-times "negative" performance in their 3-1 home defeat by Stoke. That result coupled with others over the weekend left the Cherries four points clear of the relegation zone. It was also the first time Howe's side have suffered back-to-back Premier League defeats since November. "A wonder strike for them seemed to dent our fluency and we became a bit hesitant," he told BBC Radio Solent. "The early exchanges were really positive, but from the moment they scored, the game changed and it became difficult for us. "Seeing passes and then changing our minds and going backwards, the crowd didn't like to see it and we certainly don't like to see it as coaches. "We just became a little bit negative." Bournemouth found themselves 3-0 behind after 55 minutes but did respond through Matt Ritchie after the midfielder came off the bench. "Today was uncharacteristic," added Howe. "We're usually up and at them and fluent and if we don't get the result, we're normally fluent with our passing. "Everyone seems to be on the same page. Today, for whatever reason, we just weren't. "We'll put it down to confidence, which seems to have taken a little knock." The Cherries face Everton at home in the FA Cup fifth round on Saturday.